You'll be £20.00 closer to your next £10.00 credit when you purchase The Last Days of the High Seas Fleet. What's this? On 21 June 1919 the ships of the German High Seas Fleet – interned at Scapa Flow since the Armistice – began to founder, taking their British custodians completely by surprise. In breach of agreed terms, the fleet dramatically scuttled itself, in a well-planned operation that consigned nearly half a million tons, and 54 of 72 ships, to the bottom of the sheltered anchorage in a gesture of Wagnerian proportions. This much is well-known, but even a century after the ‘Grand Scuttle’ many questions remain. Was von Reuter, the fleet’s commander, acting under orders or was it his own initiative? Why was 21 June chosen? Did the British connive in, or even encourage the action? Could more have been done to save the ships? Was it legally justified? And what were the international ramifications? This new book analyses all these issues, beginning with the fleet mutiny in the last months of the War that precipitated a social revolution in Germany and the eventual collapse of the will to fight. The Armistice terms imposed the humiliation of virtual surrender on the High Seas Fleet, and the conditions under which it was interned are described in detail. Meanwhile the victorious Allies wrangled over the fate of the ships, an issue that threatened the whole peace process. Using much new material from German sources and a host of eye-witness testimonies, the circumstances of the scuttling itself are meticulously reconstructed, while the aftermath for all parties is clearly laid out. 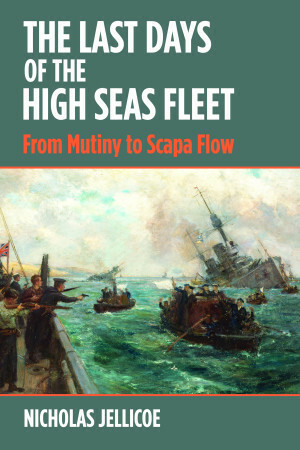 The story concludes with ‘the biggest salvage operation in history’ and a chapter on the significance of the scuttling to the post-war balance of naval power. Published to coincide with the centenary, this book is an important reassessment of the last great action of the First World War.